Larry Kaufman is a mathematics professor and an avid player of many games. In Chess, he made it to grandmaster by becoming the world champion of the seniors. He plays Shogi at a level close to that of a professional, and he has considerable strength in Xiangqi, too. He is involved in the programming of the world's strongest Chess engine Rybka. Some of his articles on this matter, like Evaluation of Material Imbalances, are groundbreaking. Kaufman has written a short methodical treatment about the pros and contras of traditional Chess variants. In this, he compares traditional Western Chess, Western Grand Chess, Chinese Xiangqi, Korean Janggi, Japanese Shogi, and Japanese Chu Shogi. Normally, the more the better, but not for frequency of draws and memorizing openings. Game length and variety of play may become too much, too. Draws 1, equal chances 1, memorizing 0.25, variety 1, history 1, game length 1, principles 1, early interaction 0.75. 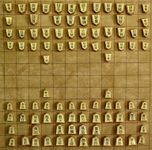 [T]he evidence is strong that shogi is the best game in the entire chess family, and with the risk of offending Go players (a game which I also play and respect greatly), perhaps the best game of all. Draws 1, equal chances 1, memorizing 0.5, variety 0.75, history 0, game length 1, principles 1, early interaction 1. It really is an excellent game and deserves a bigger following. Draws 1, equal chances 1, memorizing 1, variety 0.5 (too much), history 0.5, game length 0 (too long), principles 0.5, early interaction 0.5. I do enjoy playing the game on occasion, but since I have not played enough to know the moves of the promoted pieces without reference to the manual, both my skill and my enjoyment go way down late in the game. Draws 0, equal chances 0, memorizing 0, variety 0.5, history 1, game length 1, principles 1, early interaction 1. Shuffle chess would score the same, gaining a point on memorized theory but losing it back on history and tradition, of which it has none. Draws 0, equal chances 0, memorizing 0.25, variety 0.5, history 0.75, game length 1, principles 1, early interaction 1.